Who Will Cry When You Die? (Hindi) is a collection of 101 solutions that can help solve life’s problems. The book guides readers to live fully, and leave behind a great legacy. Summary Of The Book Who Will Cry When You Die? 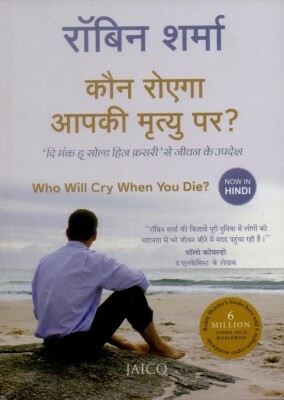 (Hindi), published in 2010, is a translated version of the original English book. It contains hundred and one lessons on how to resolve issues, and lead a better life. Sharma offers solutions that will bring about joy, success, and a deep sense of peace in one’s life. Who Will Cry When You Die? (Hindi) contains anecdotes from the author’s own life, thus making each lesson seem very practical and do-able. The first lesson is called Discover Your Calling, and it encourages readers to unleash their talent and discover their full potential. Some other tips in the guide include taking a walk in the woods, getting up early, and eating family meals. Sharma says that it is essential to speak kind words. Before saying something, it is important to ask oneself if the words are true, if they are necessary, and if they are kind. Only if the answer is yes to all three, should such words be uttered. Who Will Cry When You Die? (Hindi) urges readers to see troubles as blessings, and to keep personal journals. This self-help guide contains unique methods to beat stress, and lead a happy life. The author suggests finding three great friends, having a living funeral, becoming an imposter, and learning from good films. Furthermore, readers will also realize that they should stop condemning, and make the most of their commute time rather than wasting it. Who Will Cry When You Die? (Hindi) is a powerful yet easy to read book. It will help readers lead a fulfilling life, while creating a legacy that lasts. Now in Hindi, this guide is a must-have. About Robin Sharma Robin Sharma, born in 1964, is a Canadian author, lawyer, motivational speaker, and leadership expert. He is one of the most widely read authors in the world. He has written fifteen books, some of which are The Leader Who Had No Title, The Gandhi Factor, and The Monk Who Sold His Ferrari. Sharma completed his L.L.B. degree from Dalhousie University School of Law, and then worked as a judicial law clerk at the Supreme Court of Nova Scotia. He has also been a staff litigation attorney for the Canadian government. The author is the founder of Sharma Leadership International Inc., a business training firm in Toronto. His books have been translated into seventy languages, and have been sold in more than sixty countries. In 2011, he won the Toastmasters International’s Golden Gavel award. The following year, Sharma ranked seventh on the list of International Leadership Professional Gurus. He has also been voted as one of The Top 5 Leadership Speakers in the world by Speaking.com. The author lives in Ontario, Canada.